1 - Once all the episodes are imported on Omny Studio you can enable the RSS Feed redirection. Copy your new RSS Feed from Omny under playlist details or in the email confirming that your podcast has been imported. 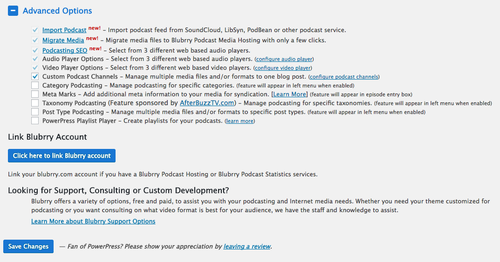 4 - Enable “Custom Podcast Channels” under the “Advanced Options” section and save. 5 - After that, a new option “Podcast Channels” will appear in the left-side menu. Open PowerPress and select the Podcast Channels option. 6 - Mouse over the podcast name: you will see the “Edit” link appear. Click on it. 7 - Now open the iTunes tab. 8 - Check the “iTunes New Feed URL” option and paste the Omny RSS Feed URL in the field “New Feed URL”. From now, your WordPress Podcast RSS Feed URL will include the tag itunes:new-feed-url containing the Omny RSS Feed URL. This tag instructs iTunes to switch fetching new episodes from the Omny RSS Feed URL. Some pod-catching platform may ignore this tag. If so, you may consider following this instruction on how to set a 301 redirect.